Getting hold of iShowU HD is simple. Just visit our website, shinywhitebox.com. If you haven't got iShowU HD yet, then that's the first step! Go to shinywhitebox.com/ishowu-hd in your browser. Click the Download button that's underneath the banner. Open the downloaded DMG file. It'll likely be in your Downloads folder. Copy the file iShowU HD to your Applications folder. You can do this by dragging it over the Applications link in the DMG. If you want to record application audio (e.g: games, Virtual Piano, the browser or other apps that make noise), you're going to need Soundflower. Don't worry, this is quite simple! The easiest way is to open iShowU HD and simply enable the "Applications" audio recording option in the toolbar. If Soundflower is not installed, you'll be prompted to install it. 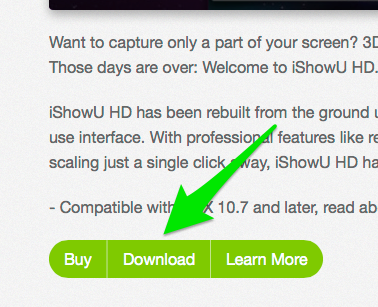 Everything required is included in iShowU HD, so you don't need to download anything. Just follow through the prompts. If you have problems, we've a separate page here all about Soundflower. Just double click the app icon from any Finder window. An alternative method is to open Spotlight and type "ishowu". That's usually enough to find it, and you run select and run it from there. Finally, you could use LaunchPad ... similar to spotlight, if it's not already in front of you just start typing and the shown icons will "search" for iShowU HD.